The river, fed by mountain runoff, was prone to flooding on a regular basis. Floods were reported in 1864, 1875 and 1878 (The Rivers of Colorado, Jeff Rennicke, pg. 85). 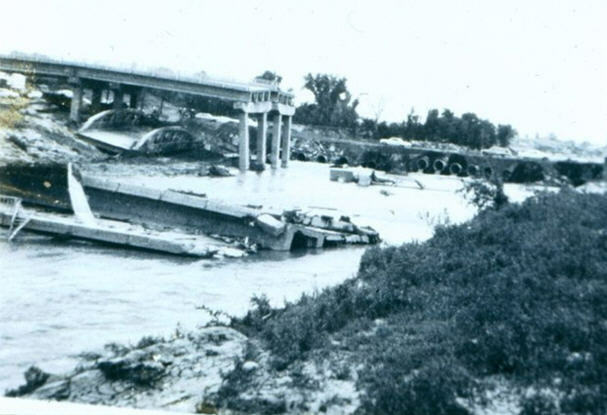 On June 16, 1965, a 100-year flood occurred when, after weeks of rain, a cloudburst to the south [of Castle Rock] hit both the South Platte and Plum Creek, which join the South Platte south of Littleton. Ord Hutcheson remembers the day. I was working south of Castle Rock just north of the Palmer Lake turnoff," he said. "Lawrence Construction was building an overpass across I-25. They laid down a 48 pipe for Plum Creek to run through and used that for a bridge over the creek. We were using soil from a nearby farm to build the overpass, and we parked our cars there during work and the equipment at night. "It had rained every day that week," he continued. "On the 16th it rained so hard we stopped at noon for lunch and they sent us home." Bonita Hutcheson, who later became Sheridan's City Clerk, a Sheridan Celebrates member, and a Sheridan Historical Society Board Member, remembers that day as well. "It was a nice, sunny day," she said, "and the children were out playing. Ord had come home early because of rain on the job site and we were enjoying our home in Rose Gardens, just off of Oxford and Federal. He was resting in his easy chair when our eldest daughter, Marnie, then 13, burst in and sang out, 'Were going to have a flood, were going to have a flood.' In her hand was a small transistor radio, very popular at the time." We, of course, said, "No, we are not, look how nice it is." "No," she insisted, "the radio said it would flood." Bonita and Ord turned on the TV and, sure enough, they were warning folks about a flood coming down the Platte River. Neither of them ever seen a flood, so they went out into the back yard. From their home on the hill above the Platte River Valley, they had a great view of the river. "Lots of folks also wanted to see a flood," Bonita said. "Cars were driving on Quincy right up to the river, and standing on the Oxford Bridge. The police finally managed to barricade both ends to keep people out of the way. Meanwhile, Bonita and Ord could see the river rising, and so he climbed up to the roof of their two-story house and clarified things she and their kids were seeing below. The river filled in Quincy, so any cars there would have been lost. Bonita's brother-in-law called to see if the family was in any danger, but they were cut off mid-conversation when a large tree hit the train bridge just south of the Oxford bridge and swept both bridges away. The telephone and electricity were on the Oxford bridge so they were without phone or power for a number of days. Bonita and her family continued to watch the river rampage and saw little campers go past, and a few large trailers. Charles West, a long-time Sheridan resident, has served as Treasurer and Councilman for the City of Sheridan, and is currently a Sheridan Historical Society Board member. He has also been a businessman in Sheridan for many years, managing the Hudson Gas Station when it was on Santa Fe Drive and acting as General Manager for the Hudson Oil Company. He recalls, My wife Irma and I, along with our children were living on Natchez Court. Our house was about where the Golden Corral is now." The Police then barricaded Natchez Court to keep people from coming in. "When the Platte River flooded," he said, "the police came and told us to move out in the late afternoon. Our family was in the process of moving. I had just come home from work. We went to Irmas brothers house in Englewood, and were able to come back the next day." In all, there were five families that had to move. They were lucky and had no damage. "Natchez Court at that location was high, and went north down the hill from our place," he said. "There were two wrecking yards down the hill. Both were washed out." Mona Armstrong, who worked for Sheridan as the water billing clerk and filled in other areas remembers, that on June 16,1965, we were having a bar-b-que." Her husband Theodore Teddy Armstrong, who became a member of the Volunteer Fire Department, and served as Mayor of the City in later years, was, at that time, the Civil Defense Director. "Teddy kept coming by and telling us to get out. I had lived there all my life so I wasnt worried," she said. Finally he insisted and they left their house in The Bottoms. Lcdr. Wes Stanfield, USN (RET) remembers, "When the flood hit, the family went to Sheridan High [now the Early Childhood Development Center] and parked in the lot with all the other families from "Frog Hollow". On June 16, 1965, Fire Department journal records this entry: At night the worst flood ever on the Platte River. About 3 feet of mud and water in the fire house. About half the firemen suffered from minor damage to losing everything they had but their car. The firemen removed all of the fire vehicles from the fire house and moved them to a field where the Pacifica Business Park now stands in the 2300 hundred block of West Hampden Avenue. From there the firemen could watch the water rising. Stanfield remembers that his dad, a fireman, sat "in his old Chevy pickup, atop the span of Hampden Ave (US 285) watching the water rise with some of the other firemen. When they went to drive out, it was down into the water westward and his truck stalled with men seated in the back. Our prayers were answered and his truck restarted and they made it back to the High School." The rescue truck stayed in continuous operation for several days. The radio in the rescue truck was the only communication with the Englewood emergency dispatcher as the telephone lines were out all over the community. Because of possible flooding on Bear Creek the police cars were stationed on opposite sides of it. The Hamilton Avenue Bridge [the steel girder city bridge that crossed the Platte River at Platte River Drive] was on the south side of the [current] US 285 bridge and acted as a dam until it split apart and the debris took the highway bridge out, inundating the lower part of Sheridan. All of the wells in The Bottoms were contaminated, and potable water had to be brought in. A few years later a water district was formed and Denver City water piped in. Many of the homes in the Bottoms area were re-built on their original foundations, or on the original site. Looking south up the Platte River following the Flood of 1965. The old City Bridge lies under 285. Part of the 285 Bridge over the Platte is half submerged in the foreground. A few days after the flood, Pat Vaglienti, Marguerite Hokenson, Mona Armstrong, and maybe a few others went into the Town Hall [at that time on Hamilton Place, next door to the old Fire Department] to get files and documents [and take them] up to the new space on South Federal. The Town Hall and the majority of its records, unfortunately, were not salvageable. The building was condemned, knocked down [with difficulty] by a D-9 Cat Dozer. That left the City without a meeting place. It was imperative to find a home soon. A temporary City hall was established in the basement of Jims Auction on Old Hampden just west of Bryant Street, in space donated by owner Jim residents whose whose homes were subject to looting so that they could come and go without showing their identification the Colorado National Guard. The City fathers leased a small grocery and the small house next door to it on South Federal, just north of Oxford Ave. The store served as Town Hall and Court, while the front of small house served as the Police Station and the addition in the back served as the building department. They later bought it and it served as City Hall for many years until they finally outgrew it and moved further down Federal on the east side of street across from what is now Sheridan's Early Childhood Center. Mona Armstrong says, "After three days the National Guard let us back in to see the damage. We had over five feet of water in the house." Mona mentioned that "Bob Webb, a teacher at Sheridan brought some men from the prison or detention center to help work on clearing put some pf the homes [down in the bottoms]." "Stanfield remembers that, "A few days later, Daddy came to me and said, 'My men all have to go back to work and I need someone to take the fire truck to use the high pressure to spray the mud out of the flooded houses. You're that person.' So my brother, Gordy, and I parked the truck in front of flooded houses and used the high pressure hose to spray mud out. During that week, I received word that I had been chosen to go to the Naval Academy and left on July 6th for Annapolis." He notes that, "FEMA's equivalent in that time designated my dad as the Flood Recovery Coordinator. He was in charge of the recovery efforts and had a budget to pay for the help. I was paid for what I did." In the days that followed the flood, Bonita remembers the National Guard stopping at everyone at the corner of Oxford and Federal to keep looters at bay. You had to show your drivers license to get into the neighborhood." After a day or so, the City Clerk issued permits for the cars, so they were no longer stopped for identification. The citizens of Sheridan are resilient and once the shock wore off, they moved into action surveying the damage and work at cleaning up. Bonita and Ord learned that a water spout had hit a mountain side to the south of his job down south of Castle Rock. It washed about 100 feet of area bare. The equipment they needed for the job was under about four feet of water and the parts trailer had moved from its parking spot. The equipment was all damaged and he was laid off the job. Damage included Rose Weeks' house on the east side of Clay St south of Oxford, which was inundated, and three of the trailers Bonita and Ord had watched go down the river were trapped in the mud for a year or so. The grocery store at Belleview and Federal was destroyed, horses from the race track [from Centennial Racetrack on the south side of Belleview] were trapped inside, and Bonita said they saw, "devastation was all around us." The bridges that were washed out were unusable for a long time. The Mississippi Street Bridge was the closest bridge to cross the river going north. Sheridan didn't have the money to rebuild for some time and it made slow-going moving around the metro area. The annual election of Firemen officers was put off because of the flood. On July 6 nine firemen met at the firehouse and spent the evening scrubbing it out. In August the department received a plaque from Sertoma for their work during the flood. Mona Armstrong says, "It was a lot of work and we were able to move back into the newly restored house on November 19, 1965." Teddy and the City Attorney flew to Washington D. C. to see about flood relief help. Their efforts yielded little help, however. But after the flood, officials began work on a new dam on the Platte in 1967. Chatfield Reservoir, owned and operated by the U.S. Army Corps of Engineers, was designed to store flood waters from both the South Platte River and Plum Creek. It's intention is for it to work in conjunction with Bear Creek Dam and Cherry Creek Dam to protect the Denver metropolitan area from floods.